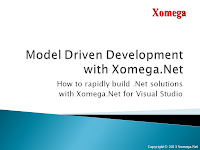 We have recently published a new video that will help you to quickly understand the main Xomega features by demonstrating how to rapidly design and build an end-to-end ASP.NET web application using Xomega. Watch this Xomega demo now to see how you can use it for building your own powerful web or desktop .Net solutions. Please let us know if you have any questions about this video or about Xomega in general.